From interacting with the visitors and repeatedly enthusing about the ancient Roman roof tiles imprinted with the footprints of various mischievous animals, to taking advantage of the very handy volunteer discounts in the shop and café (particularly when involving the enormous slices of chocolate cake), this has certainly been an experience that I shall not forget in a hurry. Possibly the greatest challenge for me this week took the form of a gordian knot on the back of a mock-Georgian dress. Happily this was solved for me by a kind volunteer, preventing the implementation of Alexander the Great’s innovative solution to the problem. One of the things that I have most enjoyed about my experience here was using the handling boxes. 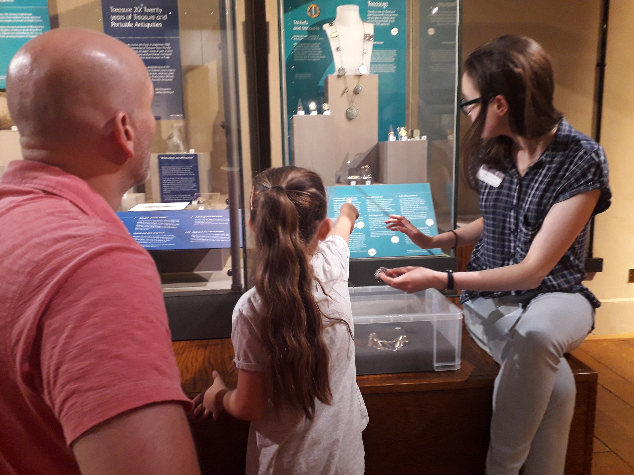 Whether these involved honeycomb produced by the museum’s legendary bees (which smelled good enough to be made into perfume), or the replicas of golden jewellery, involving 3D printing, the interactives added depth both to the visitors’ experiences of the museum and mine. I have learned a lot from this week, including (amongst many other things) more information about Mary Dormer Harris, whose legacy towards education and work for the suffrage cause continues to this day in the new suffragette exhibition and also how the ‘mother-of-pearl’ sheen is produced in certain freshwater shells, thanks to one of the free weekly talks by the curator. I have gained some invaluable experiences this week as well as having fun, and I would recommend the ‘Summer Volunteering Scheme at Market Hall Museum’ to anyone interested in history, who enjoys talking to people, or just wants an interesting experience!